Union Minister for Women & Child Development - Smt. 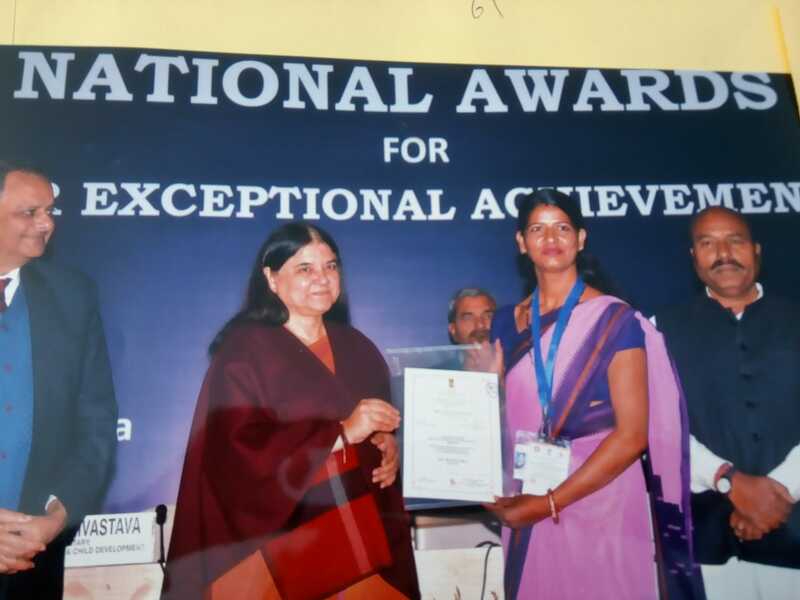 Maneka Sanjay Gandhi has conferred two Anganwadi workers - Ms. Rukmani Bhoi from Tilakheda Nand Ghar, Udaipur and Ms. Vimla Kunwar from Nayakheda Khushi Anganwadi Centre with ‘National Awards for Exceptional Achievements for the year 2017-18’ on 7th January 2019 in New Delhi. This award has been presented to 97 Anganwadi Workers (AWWs) for Exceptional Achievements for the year 2017-18 in the presence of Minister of State for Ministry of Women & Child Development - Dr. Virendra Kumar and Secretary, Ministry of Women & Child Development – Mr. Rakesh Srivastava. This annual award is given to motivate the Anganwadi Workers and to recognize their exemplary service in the field of child development and related areas under the ICDS Scheme. The Award at the National Level comprises of a cash prize of Rs. 50,000 and a citation and state Level award comprises of a cash prize of Rs. 10,000 and a citation. As per guidelines, National Level awards to AWWs are given to the awardees nominated by States/UTs out of the State/UT Level awardees. The number of nominations of AWWs at National Level depends on the size of the State/UT and operational ICDS Projects. The number of awards has also been doubled. The nominations received from the States/UTs were screened and recommended by a Screening Committee headed by Secretary, MWCD. The selection of awardees was made by the Selection Committee headed by Hon’ble Minister for Women & Child Development. With focus on Child Care – Nand Ghar & Khushi, Education – Shiksha Sambal, Unchi Udaan & Jeevan Tarang, Sustainable Livelihoods – Hindustan Zinc Mining Academy & Samadhan, Women Empowerment – Sakhi, Sports – Zinc Football Academy, Health – Vedanta Hindustan Zinc Heart Hospital & Health Camps, water & sanitation, culture, environment and community development including community assets creation, the company is touching the lives of over 500,000 rural communities in Rajasthan.